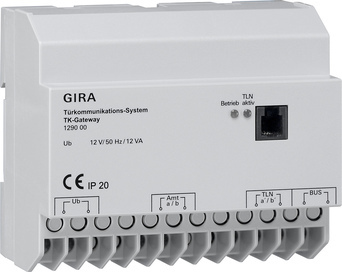 DCS-TC gateway for connecting the Gira door communication system to the existing telephone system. For an analogue telephone connection, the DCS-TC gateway is simply connected between the telephone connection and the analogue telephone. Telephone calls can be conducted on the existing telephone as usual. In addition, door calls are forwarded by the Gira door communication system to the telephone. It is then possible to speak to the person at the front door, and the door opener can be activated with the telephone keypad. In addition, door calls can be forwarded to an answering machine or a mobile phone. Acceptance of door calls via the existing telephone. Direct exchange connection, eliminating the need for a telephone system for analogue operation. Can be connected to the a/b connection of existing telephone systems. Call forwarding to a local, landline, or mobile telephone. Call forwarding to up to 50 programmed devices. Call differentiation between outside call and door call. Allows changeover between day and night mode. Supports call waiting function during an existing outside call and an incoming door call. Can be configured with a telephone keypad (DTMF-capable) or the programming set. Call and conversation duration can be set. Operation of several DCS-TC gateways on the Gira door communication bus is possible. Carrying out of switching functions via the existing telephone (DTMF-capable) in combination with the switching actuator or the flush-mounted switching actuator. LED status displays for fast analysis of whether mains voltage is connected and the telephone connection has been assigned. Programming interface and integrated flash processor for updating DCS-TC gateway software. This component enables door communication systems with more than 30 devices to be set up. The12 V output of the audio control device. A common AC 12 V bell transformer (when using the video control device). The DC 24 V power supply for door communication (when using the video control device). For security reasons, configuration changes via a telephone require the entry of a 4-digit PIN code. When operating several DCS-TC gateways in one system, each DCS-TC gateway must have its own power supply. Supplying power to several DCS-TC gateways from one control device or from one bell transformer is not permissible. The DCS-TC gateway is intended to be installed in the sub-distribution. If this is not possible, use a common surface-mounted distributor.